If you’ve ever gotten a shock from an electrical outlet or wire, you might be shy about attaching something like that to your body. But did you know electrical currents can be an effective method of pain relief? Transcutaneous Electrical Nerve Stimulation (TENS) is an electronic device that sends stimulating pulses across the surface of the skin, which is picked up by the nerves, for therapeutic purposes. 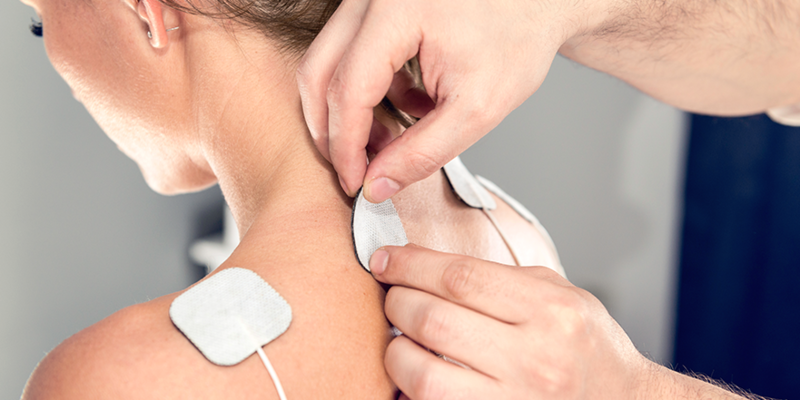 A physiotherapist adheres the battery-operated unit to your skin using two or more electrodes on sticky pads. You or your therapist can easily adjust the placement of the pads, as well as the frequency and intensity of the current, for a strong but comfortable sensation that removes pain—some even describe the experience as soothing and relaxing. The concept of electrical stimulation for pain control is quite old, with the first documentation from ancient Rome in the first century AD. Reports suggest that court physician Scribonius Largus used to stand on electric fish on the seashore to relieve pain. Though fish-standing is no longer recommended, the concept of electrical current for pain remained, evolving throughout modern times. Research in the 1960s led to the patent of the first wearable TENS unit in 1974, and in 2017 the first cordless TENS unit, iTENS was launched. The stimulating pulses of a TENS unit work in two ways: they prevent pain signals from reaching the brain and help your body produce higher quantities of its own natural painkillers, with chemicals called endorphins and enkephalins. Since TENS is a non-invasive and drug-free way to get pain relief, many physiotherapists use it to relieve a wide range of acute and chronic pain. You may benefit from this therapy if you’re suffering from pain or inflammation, nerve pain, arthritis, incontinence, osteoarthritis, back pain, pelvic pain, shoulder pain, sports injuries, menstrual pain, labour pain, aching joints or migraines. There are many different styles of TENS units available, all are portable, convenient, and easy to use at home. Not sure which TENS is right for you, read our How to Choose the Right TENS Unit blog post. Learn more about Transcutaneous Electrical Nerve Stimulation (TENS).